DUG Insight User ManualFrequently Asked QuestionsFrequently Asked Questions PetrelHow do I send horizon attributes / amplitude extractions to Petrel? Horizon attributes can be sent to Petrel directly using the Petrel Link (see Insight and Petrel Overview) by following the steps below. When a horizon attribute such as an extracted amplitude is generated, the resulting horizon or horizon property is not defined in time or depth (see Horizon Amplitude Extraction and Single-Horizon Amplitude Extraction). It can only be viewed in Map View. However, the Petrel Link is only able to transfer the elevation aspect of a horizon (i.e. TWT or TVDSS property). It is important to recognise the distinction between horizons (in IL/CL) and surfaces (in X/Y) in Petrel. In order to send horizon attributes (in this example, the extracted amplitude) to Petrel, you can assign the amplitude values as a TWT property, and then transfer it to Petrel as a regular surface. First, regrid the horizon to X/Y and choose to Save As New Horizon (see Regrid). 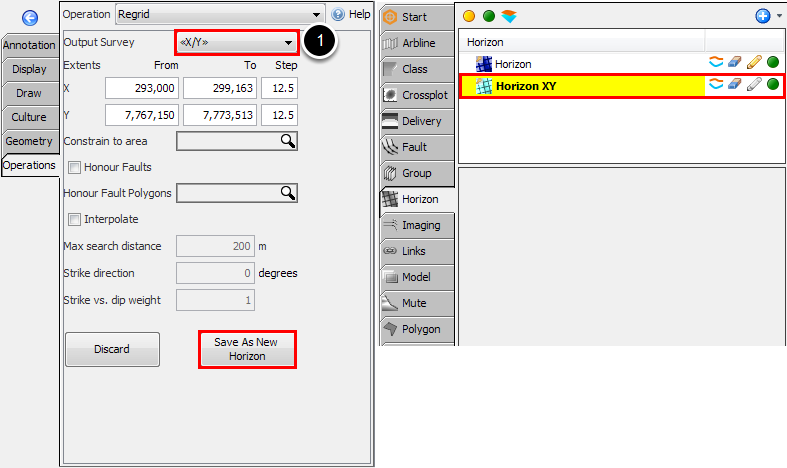 A new horizon will be created in the Horizon tab with the suffix 'XY' (i.e. Horizon XY). Then, use the Horizon Maths operation to assign a Z dimension to the amplitude values of the new horizon (see Horizon Maths). Select the new XY horizon and input property as Amplitude. Assign the Output Z dimension as TWT. Click Run and select to Create New horizon. 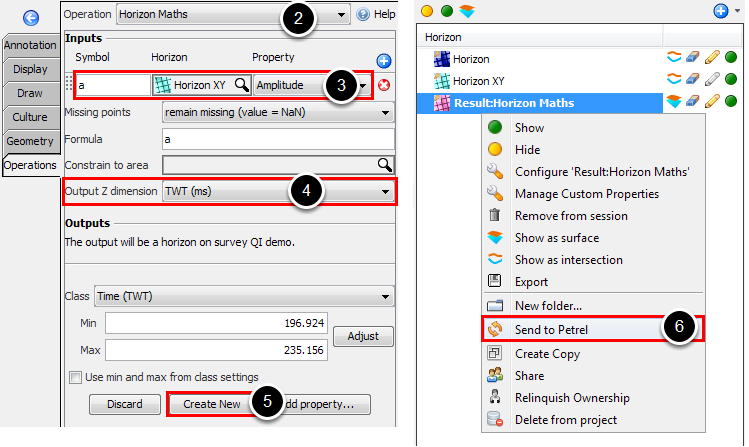 A new horizon will be created in the Horizon tab (Result:Horizon Maths). Right click on the resulting horizon and select Send to Petrel. Once transferred to Petrel, you can change its template to suit amplitude values. It would then be possible to drape this regular (amplitude) surface over the equivalent TWT horizon in Petrel. Next: Why is the Petrel Link showing me a different project after connecting?